Close to 40 years ago I walked into the Tied End pub in Middlesex England and heard the haunting Flamenco guitar sound which opens my website, it dramatically changed my life. I searched for Flamenco music. I found in a local shop a record by Philip John Lee and it had a profound effect on me. He later became my teacher and very good friend but I needed to get to the source. In my heart I knew I had to go to Andalucia. On and off over the next 30 years Andalucia became 'home' and my main creative and musical base. I have studied and played Flamenco in many places with many people, but I feel especially proud and privileged that I have been able to study, work and live with the incredible, passionate Flamenco gypsies of Andalucia who I continue to play with and from whom I still have much to learn. For many years I have been playing, managing and arranging Flamenco group concerts and events in major venues around the world such as The Albert Hall, London, England and The Palacio de Congresso, Granada Spain. I have had solo residencies as a Flamenco guitarist in places such as The Mutiny Hotel, Coconut Grove, Miami, USA; Hilton Hotel in Caines Australia and have made many international TV appearances with the likes of the UK broadcaster BBC. In recent years I have become increasingly known for my solo performances at weddings and for providing and creating unique Gypsy groups. I now specialise in performances at weddings and parties in Andalucia Spain. 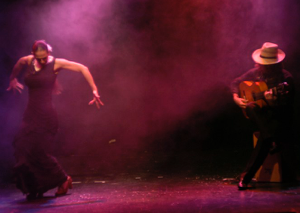 No matter how big or small, I can arrange any form of Flamenco for your special occasion. To talk about details and options please contact me Mike Jingle using my details on the contacts page. Many thanks and I look forward to hearing from you.